If you’re looking to create fun patchwork design with accuracy and precision then look no further than the fun and easy technique of foundation paper piecing. This handy technique is great to master creating patchwork designs that incorporate awkward or unusual shapes into a design… and the best part is that you don’t need any fancy equipment to get started! Foundation paper piecing has a long history, dating back to the 18th century. Its technique came from finding a way to stabilise stitched pieces of fabric by using a ‘foundation’. Originally the ‘foundation’ would have been scrap fabric or muslin, but modern FPP now tends to use paper with an actual pattern printed on the template to follow. Stitching the fabric pieces and paper together, while ensuring you follow the lines of the pattern printed on the paper, ensure precision and perfectly matched points. There are so many foundation paper piecing designs to try, covering a whole range of themes. It’s also a great scrap-busting technique. So, what are you waiting for? Why not try your hand at this addictive technique that will have you creating the most precise and fabulous patchwork designs! Follow this step by step to get started! • A selection of fabrics– we used the brand new Threaders Tokyo Blue collection. • Before starting, ensure that you have watched the videos on this CD-ROM explaining the technique. • Avoid applying the iron directly onto the shiny side of the low-tack paper. Instead, iron from the matt side of the paper or use a pressing sheet or scrap of fabric if you wish to iron from the shiny side. • For the outer sections of the template, stitch past the edges of the design to the dotted line around the template. 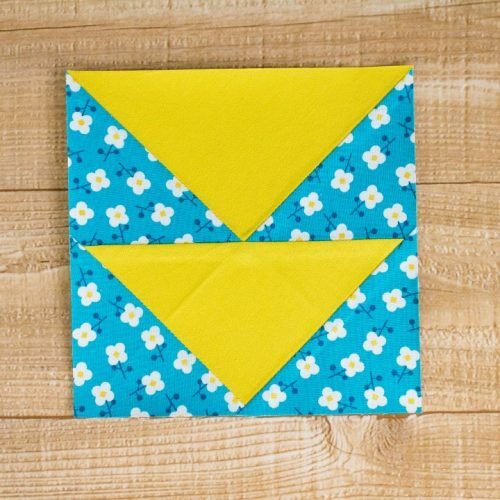 • For designs made from a number of completed blocks, follow the instructions to complete the required amount of blocks, stitch the completed blocks together in pairs and then stitch the pairs together. The same method is used if you wish to repeat a design to create a larger block. 1. Select your chosen foundation paper piecing template from the CD-ROM and print two copies of it onto the matt side of the low-tack paper. 2. Cut out one template, following the dotted line around the edges. Use a piece of cardstock to fold along each solid line within the template. 3. Cut out the inner shapes of the remaining template. For the outer sections, ensure that you include cutting up to the dotted line around the edges. Place these pieces onto your fabric and cut out the fabric pieces approximately ½” (1cm) larger. 4. Place the first piece of fabric onto section one of the template with the wrong side facing the unprinted side of the template, ensuring that it covers the section. Iron it in place to secure it. 5. Fold the template back along the line between the first and second sections. Trim the excess fabric to measure ¼” (0.6cm) from the fold. 6. Keep the template folded from the previous step and place the second piece of fabric right sides together over the first, aligning it with the trimmed edge of the first piece from the previous step. Check that the second piece will cover the corresponding area on the template once opened out and sew close to the fold to stitch the pieces of fabric together, extending the stitching to the dotted line where the section is at the edges of the design. 7. Unfold the template, open the pieces stitched together in Step 6 and press them well to ensure the fabric adheres to the low-tack paper. 8. Fold the template back along the line between the second and third sections. Trim the excess fabric showing to measure ¼” (0.6cm) from the fold. 9. Repeat steps 4 to 8 for each remaining piece of fabric on the template until the square is complete. Trim the excess fabric from around the edges of the dotted line on the template to finish the block.